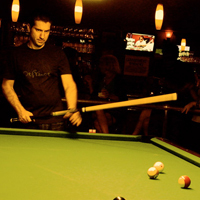 Looking for a pool cue that can take a beating? Fiberglass pool cues have coated shafts that are consistently proven to be more dent resistant and warp resistant than standard hard rock maple shafts. Here at PoolDawg, we’re proud to carry a wide selection of fiberglass bonded pool cues from manufacturers like Scorpion and Cuetec. As always, if you have any questions about our cue sticks online, give us a call at 866-843-3294 and one of our billiards specialists will help you find what you are looking for.